Down a rural road in the middle of a wide swath of pine woods sits the Blackwater Fisheries Research and Development Center, on the border between Okaloosa and Santa Rosa Counties. I arrived early on a weekday morning, ready to watch the release of one of the sites coolest study creatures: the Alligator Gar. 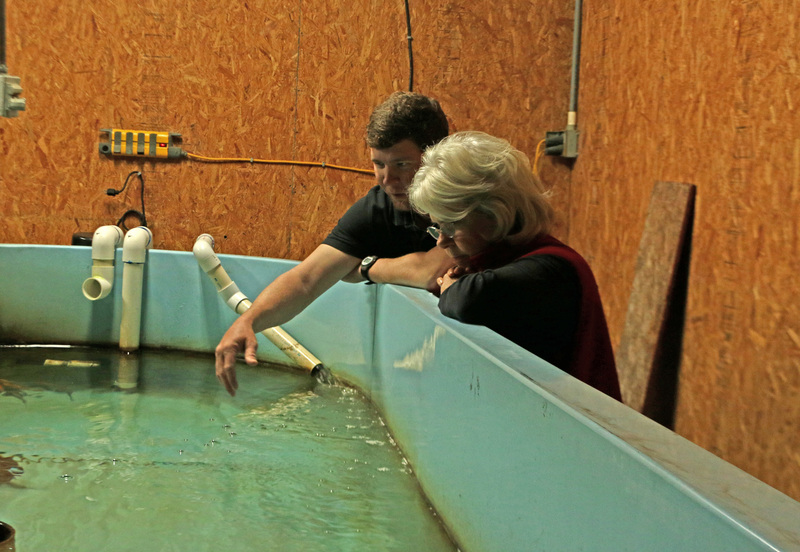 Okaloosa County Commissioner Carolyn Ketchel and FWC Biologist Matt Wegener gaze at the Alligator Gar. Alligator Gar are giant fish that can reach up to hundreds of pounds. 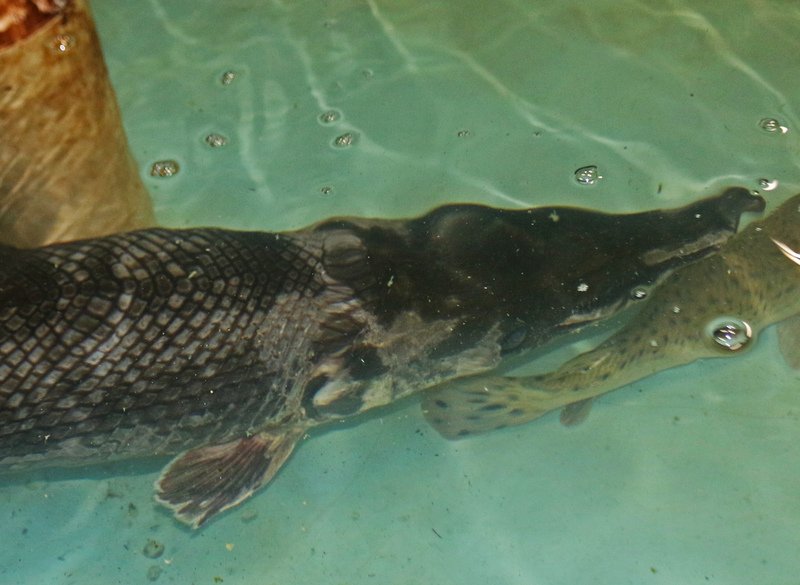 Fisheries biologists are studying their population numbers in the Yellow River, and in one particularly long tank I watched Mariposa – a large male gar – float calmly, waiting for his freedom. As part of the study, he is now equipped with a new transmitter, trackable by FWC scientists. Carefully wrapping Mariposa in canvas, the researchers moved him from the tank to a metal box filled with water on a nearby boat. Because Alligator Gar can breathe air, he will easily make the driving trip to the Yellow River, where the FWC launches. It was amazing to watch the biologists heave the heavy fish up and over the boat, releasing their gar with a satisfying splash. In addition to research, the team members here at the Center raise young Striped Bass, hybrid Striped Bass, Channel Catfish, and several Bass and Bream species in a series of ponds surrounding their offices. These young fish are stocked in lakes and rivers around the region, ready for anglers. Though the ponds were empty when I visited, one interior tank was positively teaming with catfish, and I leaned over the edge to watch them swim rapid circles around each other. The ponds attract another type of wildlife: birds. I spotted an American Kestrel sitting on an electrical line, while the forest edge was loud with Eastern Phoebes and Blue Jays. Wading birds like herons and egrets stalk the shorelines of the ponds for prey, and their abundance has led this site to be named as a destination on the Great Florida Birding and Wildlife Trail. In their front office a bird sighting log is constantly updated, and last time I visited Kate (a staff member) had recently seen Blue-winged Teal, Solitary Sandpipers, Green Herons, Little Blue Herons, White Ibises, Belted Kingfishers, and more. I am constantly looking for wildlife tours to vacation and seems you are doing it! That is awesome! If you’re going to be close to Ft. Myers, the best place to go birding is the Ding Darling National Wildlife Refuge (~40 minutes away). If you have a little more time, I would also highly recommend checking out the manatees at the Tampa Electric Manatee Viewing Center (~two hours).